Stephen R Bown is a renowned author of eight literary non-fiction books on the history of science. “My lifelong interest in history is fuelled by the lessons to be learned from studying the successes and failures of history's greatest thinkers, leaders and innovators, those who challenged conventional thinking and entrenched power structures to change their world,” he says. Bown spoke to Down To Earth on the significance of Rasmussen's work. How has Rasmussen helped us understand Inuit culture? Nearly everything known about pre-modern Inuit intellectual life is a result of Rasmussen's work in the early 20th century. Theirs was an oral culture on the cusp of enormous social and technological change. Rasmussen, who was born and raised in Greenland in a part-Inuit family, saw this change occurring around him in southern Greenland and anticipated that this change would accelerate along with the development of motors for ships, airplanes and better maps that would allow the intrusion of more people from southern cultures into regions that had hitherto been extremely remote. Because he was fluent in the culture and language of the Inuit, as well as being an excellent seal and walrus hunter and dog-sled driver, he was accepted into homes and communities in a way that no outsider ever could have been. Because of his incredible social intelligence and charisma, he was trusted and respected. Over months of living with isolated bands helped him to earn the trust of people and to convince them to share their most intimate beliefs and customs. He learned and recorded poetry, philosophy, legends, songs, religious beliefs and personal stories of tragedy, mystery and adventure. He did this in the era just before fur traders and missionaries changed Inuit culture forever. So Rasmussen's work captures the ancient aspects of a fascinating culture at that point in time before much of it was lost or altered. All cultures are always changing, but the scope of Rasmussen's work a century ago gives us a benchmark from which to compare modern developments. Rasmussen's own life was also a string of epic adventures, including a 20,000-mile dog-sled journey from Hudson Bay to Alaska. In Rasmussen we have an explorer as well as an anthropologist, a rare combination more commonly found in movies or novels. His writings are literary masterpieces and constitute a priceless contribution to world culture. What are the challenges of Inuits living in various parts of the world? The obvious answer is climate change. But I think if we go further it is cultural assimilation in a globalised world—the loss of traditions and a traditional world-view depends on how these traditions have changed. Essentially, the loss of a unique version of the question: what does it mean to be human and alive in the world? Part of the reason for this is increased global populations and the hunt for resources to maintain high-density, high-technology southern civilisations. More people from non-Inuit cultures are moving to the Arctic to work or live and bringing new technology and ideas with them, which isn't necessarily a bad thing. But it does undermine the foundation for traditional culture. If a changing climate renders impossible what remains of traditional life patterns that will, of course, further the loss of a distinct identity, which is linked to the environment. If the seasons are changing, if the animals, such as caribou and seals, are struggling to adapt to these new environmental patterns, that will necessarily affect the people who depend on the hunting of these animals for sustenance. 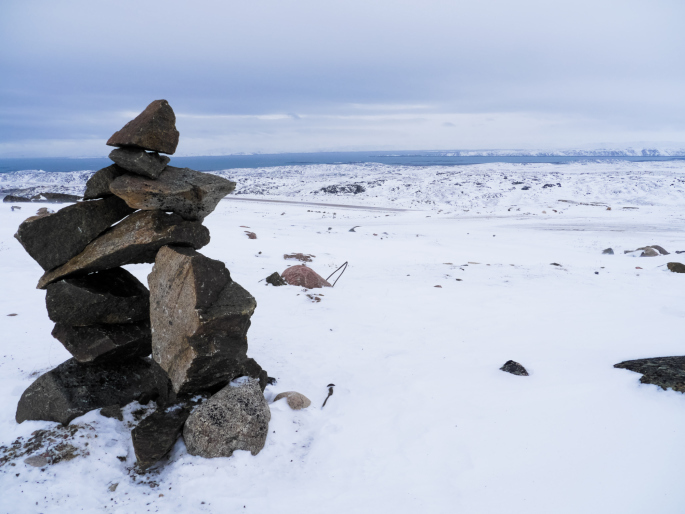 Within a couple of generations Inuit would have moved from traditional and nomadic way of life to a globalised wage economy—it is understandably a challenge to maintain a cultural identity in the face of such rapid change.